What are the latest decking trends? 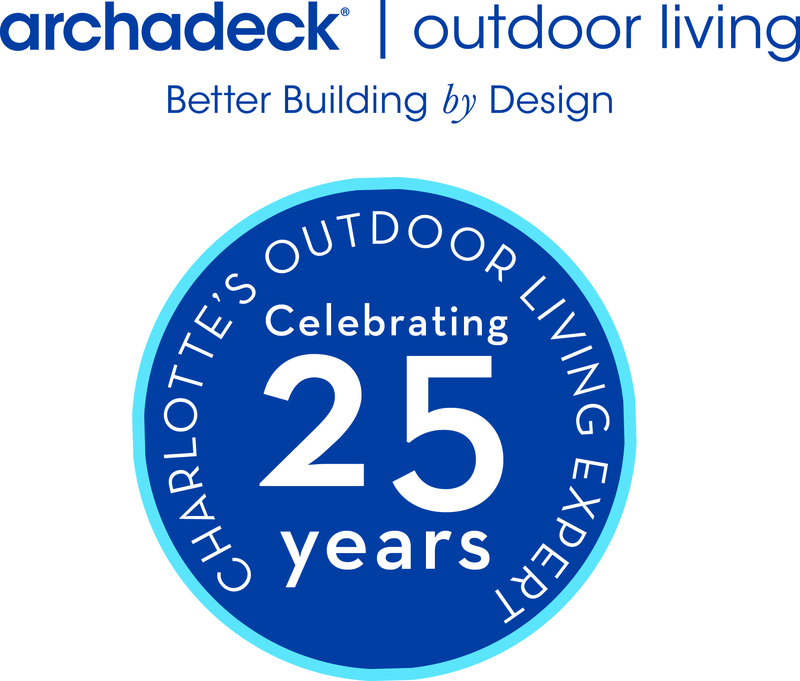 Archadeck of Charlotte is one of the largest design/ build firms for outdoor living in the USA. As the largest of the over 50 Archadeck franchises in the country, we have built over 23,000 jobs over the past 28 years in the Carolinas. Like anything else, things change over time. What are the latest decking trends? There is a continued push to low-maintenance materials such as Trex Transcends composite deck and rail, Travertine stone decks, Flagstone raised patios, etc…. We are seeing a big push for picture framing decks with accent colors and materials. People are looking more and more to make their outdoor living space more than just a deck. They prefer an integrated outdoor living oasis. Decks are a big part of this, specifically for homes that are built on crawl spaces as homeowners do not want to negotiate steps right out their back door. When we design decks today, people want outdoor kitchens that are conveniently built right on the deck such as the one shown above. They love fire features such as this wood burning outdoor fireplace built into the ground and up to the surface of the deck, wonderful for entertaining! The travertine tile deck above is both elegant and easy on the feet. 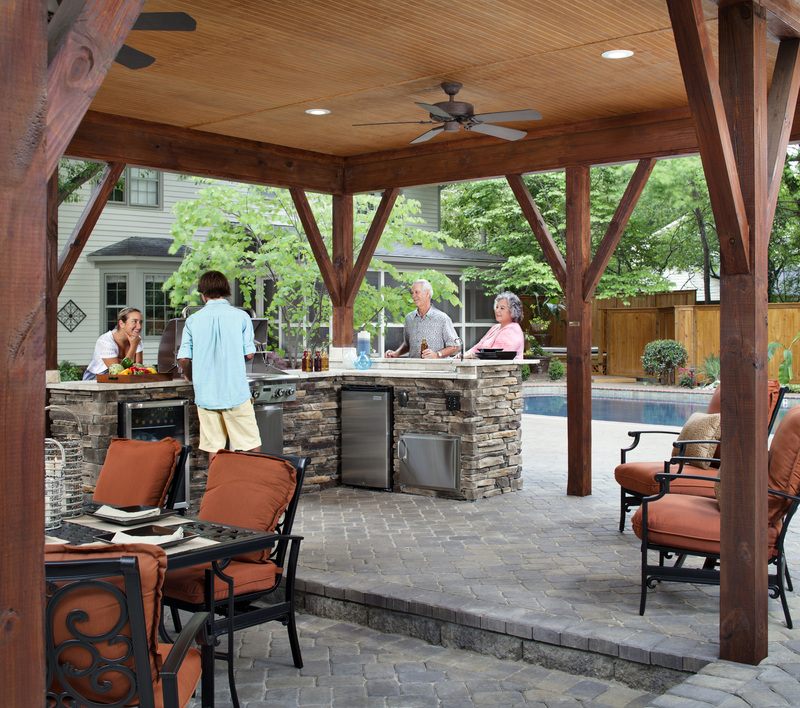 Do I need a special grill or drop in grill for my Charlotte outdoor kitchen? Archadeck of Charlotte is an outdoor living design/ build company that does over 2,000 individual projects yearly. We design outdoor kitchens as one of the many products that our customers want for their outdoor living space. A common question we get is whether you need a special grill or can you utilize your existing grill for an outdoor kitchen? The answer is most definitively that you can use your existing grill. We can achieve this with one of two designs in mind. 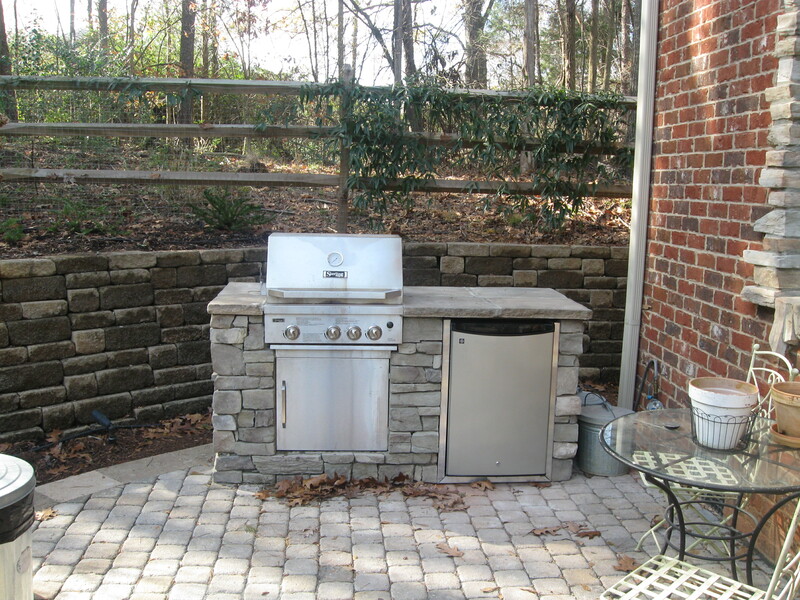 If you currently have a free-standing grill, we can simply “park” it wherever is desired and build a cabinet around it so that you can take it out when you want to replace it without having to destroy any masonry work. The second way we do this is to dismantle the grill from its current assembly and fit it into a custom opening it the cabinet we design. Below, you will find photos of these concepts. Actually, we are transforming your existing grill into the aesthetics of a drop in grill without the cost of having to purchase a new one. To ease your mind, the only thing we have to do to replace the grill once it has mortar and becomes a drop in grill is to cut the mortar and order a new grill provided you want the same size!